and boarding a flight to meet you. 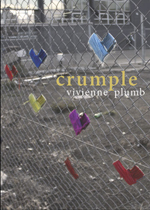 In Crumple Vivienne Plumb takes us on a series of journeys, both geographic and metaphoric. These poems have itchy feet, wandering from Poland, to China, through Italy, Australia and home to New Zealand. But is New Zealand home, or where in New Zealand is home? We roam up and down the country, we get lost in Kiwi icons which swing between hyper-real familiarity and unsettling surrealism, we find ourselves again and again on a long-distance bus. Our constant travelling companions are Plumb’s sharp observation, her quirky sense of humour, and her skill of skewering both the ridiculous and the miraculous in the everyday. ‘Best not to endure life / in the shallows, better to dive deep –’; Crumple is, in the end, a celebration of life and living. Vivienne Plumb, with a New Zealand mother and Australian father, has spent much of her life crossing the Tasman. She is one of literature’s all-rounders; as well as six previous collections of poetry, she has written and published plays, short fiction and a novel. 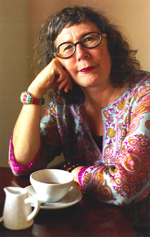 Vivienne has held many awards and residencies, including the Hubert Church Award for a first book of fiction, which she won for her collection The Wife Who Spoke Japanese in Her Sleep (1993), the Buddle Findlay Sargeson Fellowship and the University of Iowa International Writing Programme.